CIF-SS XC Prelims & Finals will have LIVE Results at the 1.5 mile mark showing real time Team Scoring. Know your teams place at the half way point as you battle to advance to CIF-SS Finals and the CIF XC State Championships. Go to http://Live.FinishedResults.com to download. Girls Race: 3:57 pm, Heat 1 of 2 for Div II girls; We run fast and have a great experience! Be a part of the magic! QUALIFYING TO FINALS: 2 heat divisions: Top 8 teams will qualify for the finals from each heat for a total of 16 team qualifiers. Individuals finishing in the top 12 from non-qualifying teams will qualify from each heat. UNIFORM REGULATIONS: Each member of a team will wear the SAME color and design school issued uniform JERSEY AND SHORTS or one-piece. When other apparel is worn under the jersey and/or shorts by more than one (1) team member, the apparel must be the same solid color. Running shoes are required for cross country competition. Shoes with spikes are NOT allowed. Hair ribbons and sweat/head bands (blank except for manufacturer’s logo) will be allowed. PURCHASING TICKETS: Riverside Cross Country Course (PRELIMS): All runners and coaches will be admitted through the participant’s gate located at the Clubhouse located at 1011 Orange Street, Riverside. All spectators, non-qualifying athletes, extra coaches, managers, pep squad members, bus drivers, faculty members, timers, etc., MUST PURCHASE general admission tickets at the main entrance located off the main parking lot on Orange Street. Gates will open at 6:30 a.m. USE OF A DRONE IS NOT PERMITTED. NO CHECKS WILL BE ACCEPTED AT THIS EVENT HOWEVER, CREDIT CARDS WILL BE ACCEPTED. STUDENTS MUST SHOW ID TO RECEIVE THE DISCOUNTED STUDENT PRICE. PARKING: Riverside Cross Country Course (PRELIMS): $10.00 parking fee in the main parking lot located off Orange Street. Parents and spectators will enter the course through the main entrance off this lot. 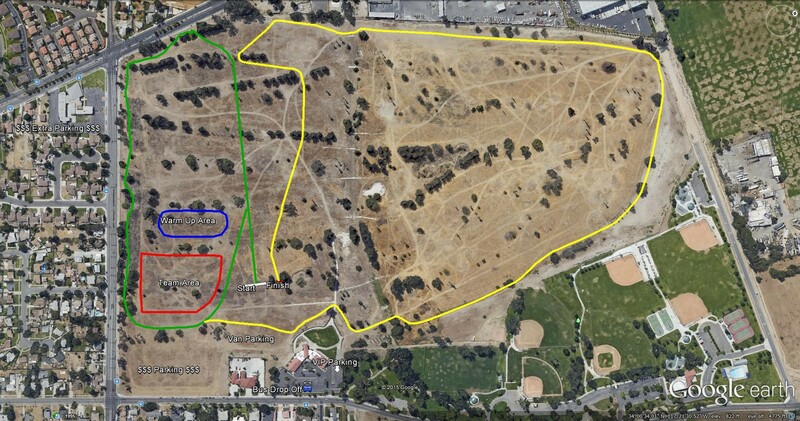 DIRECTIONS TO RIVERSIDE CITY CROSS COUNTRY COURSE – Preliminaries Saturday, November 14, 2015 The Riverside City Cross Country Course (formerly the site of the Riverside Golf Club) is located in Riverside on Orange Avenue – 1011 N. Orange Street , Riverside, CA 92501. There is a parking fee for all vehicles except school buses and school district marked vehicles – $10.00 per vehicle. From the 91/215 Freeway, exit Center Street and go West on Center Street to first stop sign (Orange Street). Left on Orange for 1 mile to main entrance parking lot. (Instructions for Bus/Marked School vehicles noted previously). From the 60 Freeway, exit Main Street and go North on Main to Placentia (about 2 miles). Turn right on Placentia-it will turn into Center Street. Take Center Street to Orange Street and turn right. Go about 1 mile to main entrance of parking lot. If exiting Main St: Go North on Main to Placentia (about 2 miles). Turn right on Placentia-it will turn into Center St. Take Center to Orange St and turn right. Go about 1 mile to Clubhouse parking Lot. All buses will discharge their athletes inside the parking lot. The drivers will be given directions to bus parking at that point.